Is Starter Kit More And More Popular? Now more and more people joined Ecig team .As a new vaper we want to find a vape which easy to use and easy to carry.So more and more people choose Starter Kit. Here are some good Starter Kit you 'll like . Vaporesso Orca Solo Starter Kit comes with 1.5ml capacity tank. Powered by built-in 800mAh battery, the Orca Solo provides a long-lasting vaping time to you. The included tank features top refill. The unique CCELL coil is optimized for high nicotine satisfaction. The Flash Heat System brings purer and smoother flavor by rapid and even heating. 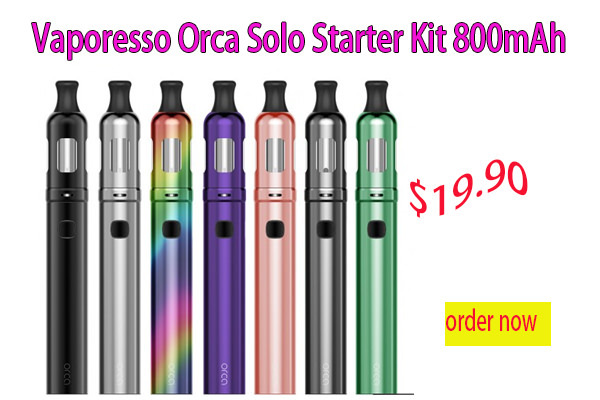 The Orca Solo is perfect for starters and Mouth-to-Lung enthusiasts.